If there are two things we love it's shopping and supporting local brands. With Christmas around the corner, things can get manic and there is nothing worse than trooping around a busy shopping centre dodging trolley's and screaming children all while mentally ticking off your shopping list. 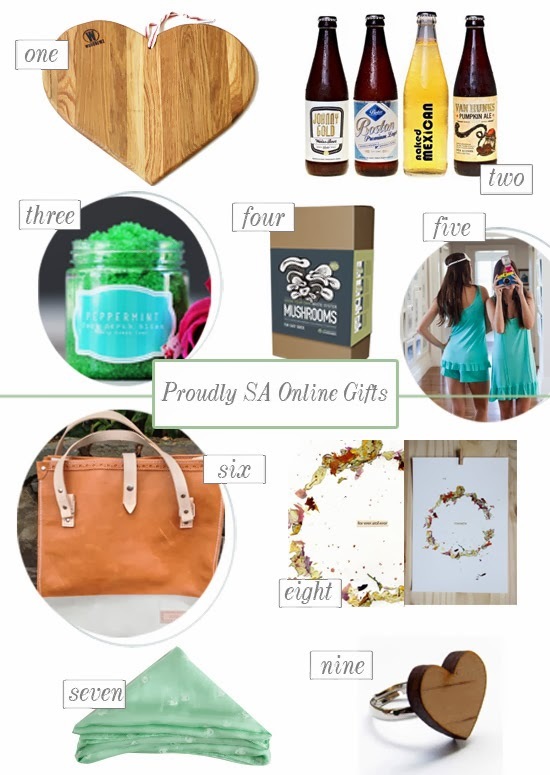 That's why we love online shopping and why we've put together this great gift guide of local products that you can find all online. 1 - We love the idea of giving a beautiful bread board along with some homemade pickles or jams as a gift. This heart shaped board from local Durban brand Woodnewz is perfect as a gift. And at only R380, it gets our vote! Extra Bonus: you can choose what wood you want your board to be in! 2 - Craft beer is all the rage at the moment and we love this selection of Boston Breweries Craft Beer from 5 Ounces. Expect to get four of each variety in a mixed case for only R240! Extra Bonus: 9 Ounces charges a flat rate of R50 for all deliveries. 3 - Hey Gorgeous Skincare products are taking the internet world by storm with their affordable prices and great online presence. Be sure to order in advance as their turn around time can be a bit slow. We love this Peppermint Foot Scrub for only R90. Extra Bonus: Their products are 100% organic and only contain natural ingredients. They also do not test on animals. 4 - We love the idea of growing herbs and veggies in your garden. So why not grow your own mushrooms? The Mushroom Factory offers a variety of grow-it-yourself options. Our favourite? The pink oyster mushroom variety for only R155. Extra Bonus: Growing mushrooms is as simple as just adding water to your box. Perfect if you don't have a green thumb! 5 - We love Anna Louise Sleepwear for it's comfortable PJ's, great design and super value for money This frill nighty in powder blue is our favourite at only R260. Extra Bonus: The new summer range comes in an array of colours including watermelon, mint, stone, black and lemon and there is a limited men's range too! 6 - We've been fans of Savior Brand Co for a long time and just love the quality and workmanship that goes into each and every one of their products. We would love to own this 2-tone Brogue Detail Tote. For R1200, we think it's well worth the investment. Extra Bonus: All products are hand-stitched and made with the utmost attention to detail. 7 - We featured Jane Sews a while ago and we still can't get enough of this local brand. We love the look of this mint green silk scarf for R249.00. It comes in a gorgeous navy too. Extra Bonus: Clothing lines are limited so you're in for a unique purchase. 8 - We love the idea of giving art as a gift. This For Ever and Ever print from The Sarah Spring Collection ticks all our design boxes. Make it yours for only R80. Extra Bonus: The Sarah Spring Collection has a variety of prints, so why not buy one or two to make a set? 9 - Genevieve Motley is an established Durban brand and we love the look of this wooden heart ring. Buy it for your best friend at only R85. Extra Bonus: look out Genevieve's great wedding products like groom's boutonnieres and cuff links.